Hi, my darlings! Just two days before I fly off but before I go, I must show you some beauties I've reviewed recently! If you recall my humongous 1st Blogaversary celebration, Missi of DIFFERENT Dimension was sweet enough to make not one, but TWO custom polishes just for the occasion! And tonight, I finally get to show them off to you! If you're in the market for customs, Missi is a great choice! First up is Radiance Within--Missi's take on the lighter shade of this year's Pantone Color of the Year, Radiant Orchid. This beautiful polish is a lavender/lilac/pale orchid with a creamy holographic finish. Fabulous application and formula--no streaking, no muss, no fuss! The swatches below show 3 thin coats by itself. What a beauty! The second of the duo is Bubble Up--a gorgeous clear glitter topper with pale pink, holographic silver and pale mint circles in various sizes, accented with a ton of holographic shimmer. Missi knows how much I love circle glitter and this one packs quite the punch! I had absolutely no issues with the formula or application--even the large circles came right out of the bottle with ease! 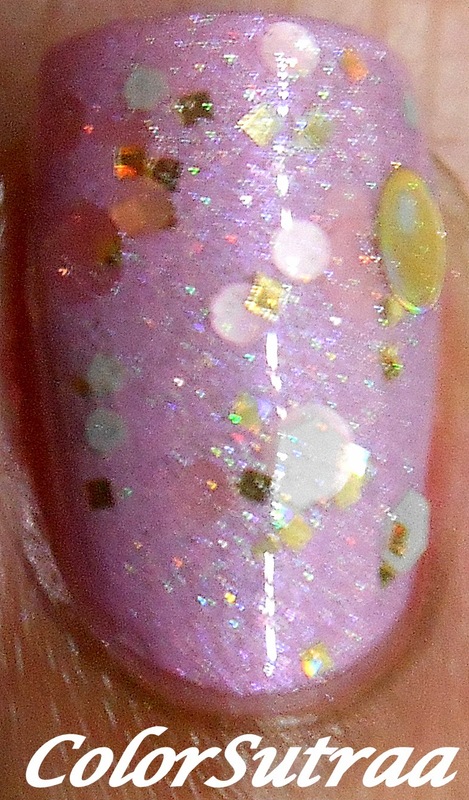 The swatches below show 2 thin coats of Bubble Up over Radiance Within above! SO in love! With flash, to show off that holo shimmer! So there you have it, my darlings! My beautiful customs from DIFFERENT Dimension! If you would like to check out Missi's store, you can find it on Etsy HERE--maybe you want a custom of your own?! You can follow Missi of DIFFERENT Dimension on FACEBOOK and on INSTAGRAM for all the latest news and updates! What do you think of my customs? Tell me about it in the comments section below! Oooooo. Radiance within is beautiful! !!! !